Considering a study abroad program this year? Study Abroad programs can offer some of the most important learning adventures of a student’s life. These experiences, conducted on a global level, will expand a student’s understanding of the world in ways that aren’t available in a classroom. Some of the benefits of a study abroad program include the chance to meet new people, discover new foods, learn new cultures, and gain valuable new skills. As a potential job-seeker, these skills look very impressive on a resume. In the changing climate in our global world, students and parents might be more concerned about participating in any international program, particularly in Europe, where the majority of American students study abroad. Security risks are everywhere and while terrorism or other mass attacks occur across the globe, the odds of being involved in one remain relatively remote. Still, caution, no matter where you are studying, is advised. Colleges are starting to include emergency protocols as part of their overall study abroad programs and security precautions are now covered during student orientation. Some study abroad programs require that students travel with a smartphone and have access to a reliable and secure Wi-Fi connection. Here are a few safety tips to keep in mind for students embarking on a study abroad program. Leave copies of your passport and other critical documents (including credit card information) with someone you trust at home and keep a set for yourself in case your original documents get lost or stolen. Consider keeping a set in the cloud for easy access. Before you go, research the cultural do’s and don’ts and the local laws in the country. Once there, learn the landmarks in your neighborhood and how to get around easily. Know the location and phone numbers of the nearest emergency care center, U.S. Embassy or Consulate, or other visible and secure locations (an international hotel, for example). Follow the U.S. State Department’s TravelGov account on Facebook or Twitter to get safety and security information. You can also register with them and sign up for security updates through their Smart Traveler Enrollment Program (step.state.gov). A medical emergency or unexpected travel can cost thousands of dollars, which can ruin any study abroad experience. Sign up for travel insurance and look for one that covers travel, medical and evacuation expenses. If you get separated from your phone, keys, or backpack while abroad the tiny remote will start to beep in your pocket or wallet. With a range of 100 feet, the separation alert will let you know as soon as you forget your phone – whether you are on a train, coffee shop or in a subway. Set up a regularly scheduled time to check in with family and friends, and agree on how you will do it – whether via email, text, social media, or a phone call. Wireless Traveler works closely with several student organizations and travel advisors planning travel abroad programs to help them design the best options to stay safely and securely connected with their students. Our range of Wi-Fi options can help ease any connection concerns. 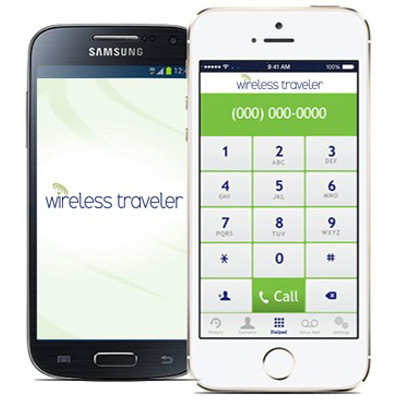 Download the Wi-Fi Calling App to make low-cost secure Wi-Fi calls to a cellphone or landline. Call the United States for 2 cents per minute or app to app are free. Call locally and abroad for pennies. Available on iPhones, Androids, or iPads. Rent or purchase a global Pocket Wi-Fi Hotspot to securely access the internet on a smartphone, tablet, or laptop. The Wireless Traveler hotspot supports up to 5 devices, and with flexible data plans, is perfect for students traveling overseas. Add prepaid data and manage data usage directly from our website portal. For students with unlocked smart phones, renting a low-cost Super Saver SIM card is a great option. It can be used in over 190 countries at drastically lower calling rates than through a U.S. domestic network provider. Calls to Europe are as low as 30 cents per minute. Incoming texts to both the US and European number on the SIM card are free.